It was the night of December 26. 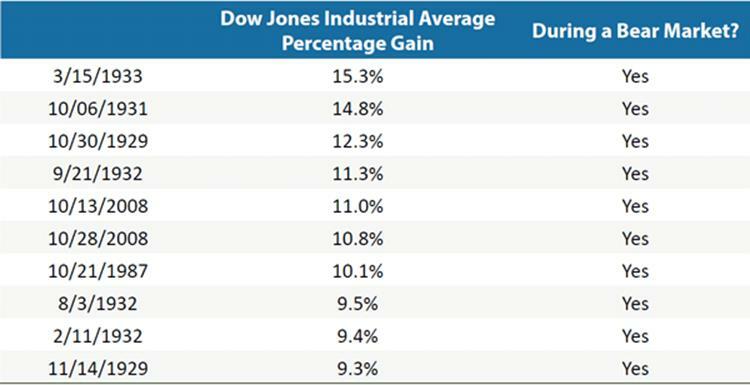 Earlier that day, the Dow Jones Industrial Average had surged over 1000 points. Some people saw this as a sign that investor confidence had returned. But big surges like this are common during bear markets. In fact, they happen more in bear markets than bull markets. Here’s the key to judging market swings: Never measure the market’s gain or loss in terms of points. You should always look at a percentage move. The biggest stock market move in history was a 500-point drop. It was Black Monday, October 19, 1987. That is half of the December 26 move in terms of points. But it was a crushing 22% loss in a single day. The December 26 move might have been 1,086 points, but it was only 5%. Such percentage moves are quite common in bear markets. The record shows that bigger single-day gains tend to happen in the worst bear markets. Don’t get too excited, though. Because this pattern cuts the other way. 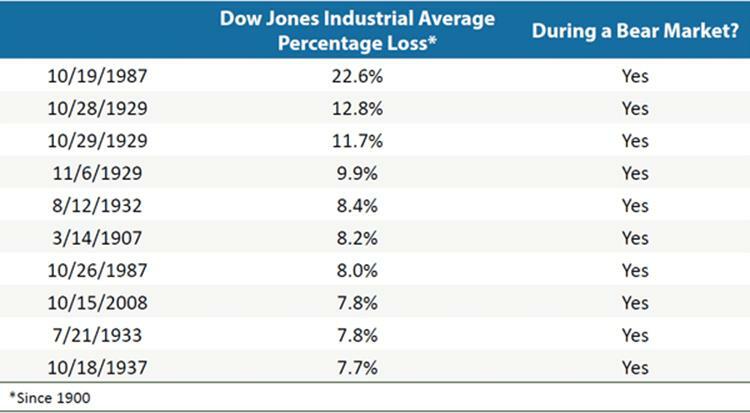 Again, history shows us that the largest one-day market declines are much more common in bear markets. So, in a bear market, investors should expect higher stock market volatility both ways. This has major implications for your portfolio. The hashtag #BTD is wildly popular on Twitter. It stands for buy the dip. It means that when the stock market falls (or “dips”), investors should take advantage of the cheaper prices and buy. There were thousands of people using this hashtag during the 15% sell-off that preceded the December 26 stock market bounce. This stands for sell the rally. This means that when the stock market jumps higher, investors should use it as a chance to sell their risky stocks and buy safe assets. Big one-day market spikes are nothing to cheer. And they don’t mean the downtrend is over. Rather they are warnings that more downside volatility is ahead. Gold is one of the best hedges against market volatility. When markets fall, gold tends to rise. A common way to get exposure to gold’s price is to buy gold miners. But there’s a much safer and more profitable breed of gold companies to invest in. The company I recommend in this sector is the gold and silver streaming company Wheaton Precious Metals (WPM). WPM provides cash up front to mining companies to help them run and expand their operations. It becomes something like a silent partner. In return, it receives the right to buy gold and silver from the miners’ future production at an agreed price. And that’s good for a couple of reasons. First is unlimited upside. When gold prices rise, WPM still pays a set price. The company reaps higher profits and so do its shareholders. Gold streamers have historically done great when stock markets turn volatile. For this reasons, I highly recommend adding WPM to your portfolio before the market goes south.